Car features a sunroof and an additional ash-tray by the Driver's side seat. 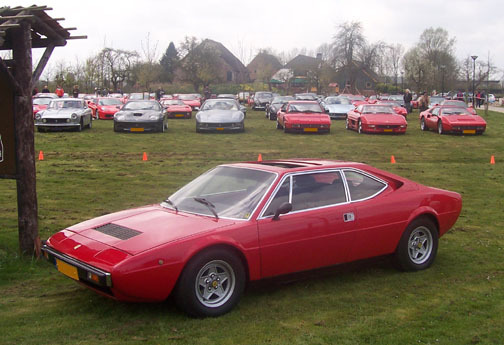 This car is one of five specially prepared 308 GT4's for use in various car shows in Europe. 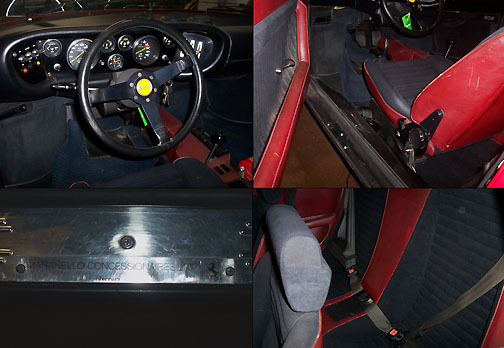 The prep work was carried out by "Maranello Concessionaires" of Surrey, England (indicated by a special plaque affixed to the driver's side door sill - see above photo). Car was then exported to the Netherlands in April, 1976. 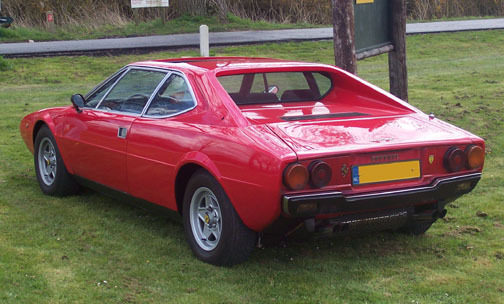 In the years between 1976 and 1986, the car may have been involved in an accident, as it had been repainted to Red and the 308 GTB round taillights were fitted. This work was done by "Kroymans", the Dutch Ferrari importer/sales/service facility. Also, the current engine in the car is not original and may have been replaced during this time period as well. Current owner (info as of January, 2007) has owned the car since August, 1986. The above front view and rear view photos were taken on April 12th, 2008, at a Ferrari club event in the Netherlands. This was the only GT4 that appeared at this event!